Do we want water that looks like this? 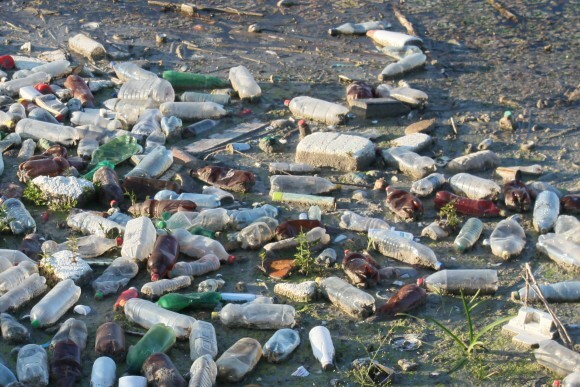 Plastic lasts forever… our oceans are turning into plastic soup. It doesn’t biodegrade and no naturally occurring organisms can break it down. Plastic photodegrades, which means that sunlight breaks it down into smaller and smaller pieces. Those small pieces drift in the ocean and are mistaken for food by fish and birds. It is undisputable that plastic pollution is killing marine life through ingestion and entanglement in plastic marine litter. 1) Use cloth shopping bags. For each reusable bag you use, it’s estimated that another 400 plastic bags will be kept from being used. 2) Forget bottled water and carry a reusable canteen. Every reusable water bottle will keep another 167 plastic bottles from entering the environment. 3) Bring a reusable mug when you go to your local coffee shop. 4) Skip the straw, which are one of the top 10 items found on beaches. 5) And, of course, Recycle!